Also known as Bluebeard or Blue Mist flower, Caryopteris x clandonensis is a low maintenance yet beautiful blooming shrub. ‘Dark Night’ produce a profusion of deep purple-blue flowers in late-summer through early-fall. When not in bloom, the fragrant dark green leaves offer good contrast with their silvery undersides. Bluebeard can be used as an accent shrub in a perennial border or a low un-sheared border hedge. 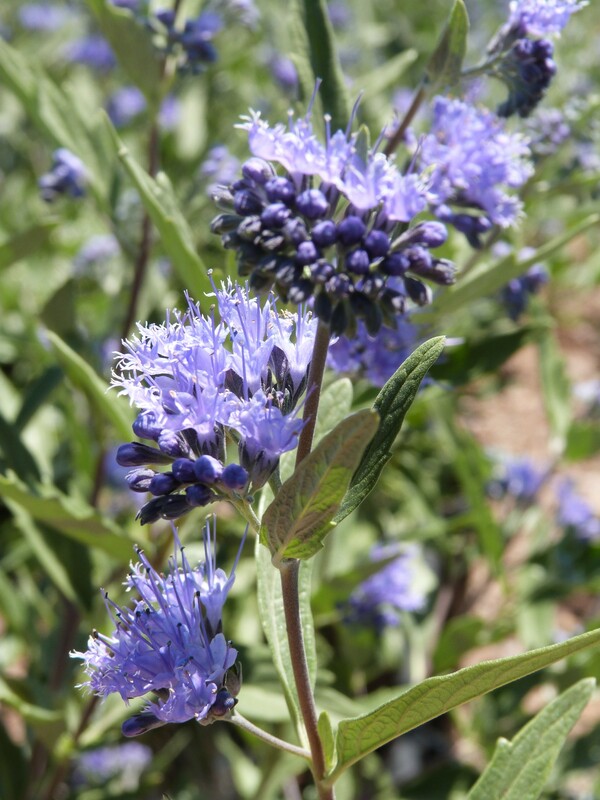 Plant Bluebeard in a sunny location in well-drained soil for the best performance and flowering. Plants bloom on new growth so they can be pruned in early spring. While ‘Dark Knight’ has no serious insect or disease issues, its crowns may rot if overwatered or planted in poor-draining soil. Once established, plants are drought tolerant. The flowers are irresistible to bees, butterflies and other beneficial pollinators.